Unlike the footwear of the past, shoes and boots today can be crafted out of many different materials. While most basic modern shoes are made with some type of rubber or plastic sole for comfort and protection from ground surfaces, some high quality shoes are still created with leather soles. In addition to expensive formal shoes, casual slippers, costume boots and other footwear are also paired with leather soles. You can make your own leather soles for any type of shoe, new or in need of repair. Place a sheet of paper on the floor. Stand on the paper with your feet apart, and have a friend help you trace around the outsides of your feet. Draw over your tracing lines, refining the foot shapes so that they are smooth and do not show any individual toes. Cut the traced soles from the paper. 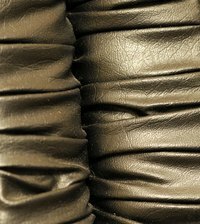 Lay the sole patterns on top of a piece of medium-weight leather. Secure them to the leather using pins. Cut around the edges of the pattern pieces so that you have identical leather versions of your patterns. Attach the leather soles to your chosen shoe tops by stitching the soles to the shoe tops with a leather sewing needle. "The Art of Boot and Shoemaking;" John Bedford Leno; 1885. "simple Shoemaking: Instructions and Patterns;" Sharon Raymond; 1999.